Preheat your oven to 180˚C/350˚F/gas mark 4. Peel the carrots, cut them into quarters and add them to a bowl with the red onion cut into wedges. Pour the olive oil over them and toss them so that they’re completely coated. Tip them into a roasting tin and scatter with the cumin seeds, chilli flakes, thyme and seasoning. Add the garlic cloves in their skins and roast for 30-45 minutes or until completely tender, then remove them from the oven and turn the temperature up to 220˚C/475˚F/gas mark 7. Rub the butter into the flour and salt in a bowl, using your fingertips, until it resembles breadcrumbs. Run your fingers down the sprigs to remove the thyme leaves and add them. Make a well in the centre and pour in the buttermilk. Mix everything gently with a palette knife until it comes together and then turn it out onto a floured surface. Knead briefly, before pressing the dough out into a rough circle, just over 1in thick. Using a knife, score deeply into the surface of the dough to make wedges, like slices of cake, and brush with the beaten egg. Place the dough on a lightly greased baking sheet and bake it in the hot oven for 15-20 minutes or until golden. Once cooled, tear the scone loaf into separate pieces. Add the lentils to a saucepan with the chicken stock. Bring to a boil and then simmer for 15 minutes. Add the roasted carrots to the saucepan, along with the cooking juices, herbs and spices from the roasting tin, and squeeze the cloves of garlic from their skins. 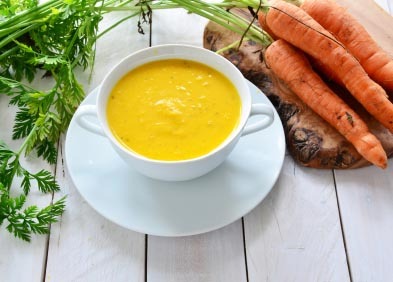 Using a stick blender, process the ingredients until you have a soup. Add more stock if needed. To serve, divide the soup between bowls and add a spoonful of Greek yoghurt, with the scones on the side. bonate soda, 200g brown sugar, 125g melted butter, 50g chopped pecans, 50g chopped walnuts, 100g sultanas, 300g buttermilk, 1tspn vanilla-bean paste and two beaten eggs. Once mixed, pour into cases. Bake at 180˚C/350˚F/gas mark 3 for 25 minutes and allow to cool before spreading with cream-cheese frosting made from 600g icing sugar, 100g butter and 200g cream cheese mixed together. Cut 400g of carrots into matchsticks and boil until tender, but so they still have a bite to them. Add a handful of sultanas to the water for a minute at the end and then drain. In a bowl, combine a splash of olive oil, the juice of an orange, a crushed garlic clove and a teaspoon each of cumin, paprika, cinnamon and seasoning. Mix well.